I wasn’t going to blog this quilt since this is the ump-teenth time I’ve shown you a quilt like this…..but after sitting through an agonizing hour(s?) of quilting I needed someone to grumble too. And you my friends…are that someone. I love the look of straight line quilting but it is torture for me. Seriously…I hate it. Next time I need to get a good book to listen to. The winner of the giveaway is Mickey White ( I sent you an email!). So funny… "Luckily straight line quilting is kind of like having a baby for me….pretty soon I’ll forget all about the pain and want to do it again"
I haven't had a baby but it sounds pretty awful so if straight line quilting is that bad, maybe I want to avoid it too haha. Haha! I turn on Bob Seger when I have a torturous quilt job to do. Works every time. Ooohhhh…I love this quilt! And I agree about the straight line quilting! It looks fantastic and is boring to do. That's the time I turn on books on tape (or CD as the case may be). Zig zag top have a special place in my heart:) The listening to a book while quilting is a wonderful idea. I tortured myself with straight line quilting recently too! Lovely, lovely! I don´t know hw you manage to keep your lines soooo straight. It may be painful but it surely is worth it! Congratulations! I like the quilting and the quilt. I love that you show us your zig zag quilts. It's great seeing the different color combos. I hear you, though, about straight line stitching. I so love the look, but it can be sooooooooo boring! Thanks again for sharing. The quilt was certainly all the effort, it is beautiful. A quilt your can give away and never see again——–a baby, I don't think you can do that, although there are some days it might be nice. I love it!!! I'm so glad you blogged about it. It's gorgeous!!! As long as the quilts rock like yours do I don't mind to se even 100 more zig-zag's. Also, I love the straight-line quilting on this pattern. It enhances just perfectly. 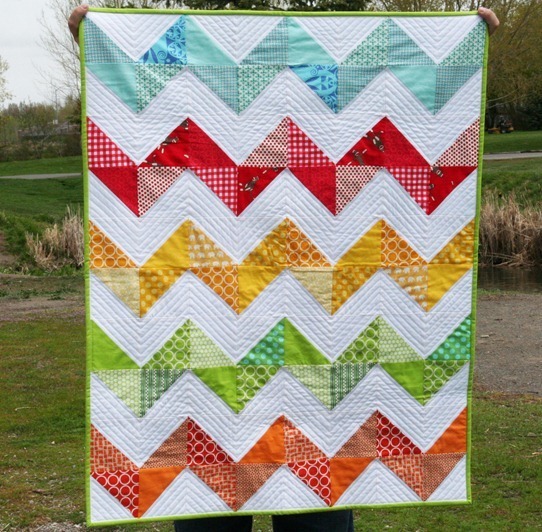 I just can't take my eyes of your zig zag quilts – everything is perfect! I'm beginner and still my zig zag quilt are far away from yours! Oh I love it. And it's funny- I love straight line quilting because I think it's easy. Might be because I still haven't gotten the hang of FMQ. Love the look of yours! I know exactly how you feel about straightline quilting but the end results are always amazing!! I love your end result!! It's absolutely breath-taking!! HILarious. I totally just blogged about how boring it was too.. LOVE the look.. HATE the quilting. This is a beautiful quilt! I hope you can find a book to listen to for the next project. I feel the same about straight line quilting but think it's beautiful in the right application such as this. Oh this is a very cute quilt. I love the zig zag quilting too. You can complain anytime you want:D We all know you still really enjoy the finished product as much as we all do. The work you put into your quilts is sooo worth it! Keep 'em coming! straight-line quilting is sort of zen for me. i love that i can just sort of turn my brain off. It's beautiful.. How do you keep your lines so straight? First of all the straight line quilting is AMAZING! Secondly what is your backing fabric it is fantastic and just what I am looking for! Lovely quilting! Worth the pain. And I'll add my voice to those saying you are not alone. Straight-line quilting is so tedious. I try to talk myself into FMQ instead for everything. But sometimes straight lines are what the quilt wants. Glad you stuck it out on this one. I LOVE the quilting! I love geometric shapes for my quilting. Your quilt is very stunning. I must admit I don't like SLQ either, at least not the sewing. But it does look awesome on your quilt. I really need to make a zig zag quilt. Since I started quilting, I started getting 2 audio books per month from audible.co.UK for £8. I buy books that are at least 25 hours long. The longer, the better. It makes even tedious quilting quite pleasant. I've built up a mini library of great listens, all for free or £4 each! If you want some recommendations let me know! As much as I hate audible's DRM thingy on my laptop, cheap audiobooks are sooo nice! Beautiful! Do I dare attempt this for a second quilt, or is it too ambitious? Stunning…keep bringing them on!! Love 'em! I don't mind straight quilting but no matter how much I baste or pin I still end up with tucks on the back. Do you have any suggestions how I can prevent this. Love this quilt! Do you mind sharing your fabric choices? But it looks so cool when you do all of that straight line quilting!!!!! You've inspired me…. I'm going to start a HST zig zag quilt tonight!! So cute!! Hmmmm, has this lessened or increased my fear of half-square triangles? It turned out beautiful!!! I love the quilting. It's perfect! It may be tedious, but it is gorgeous!! Great work! Just beautiful!!! Love the colors!!! This has got to be one of my all time favourite quits. Love it. I never get tired of seeing your zigzag quilts. Making one is at the top of my list of gotta-makes. So keep on showing them to us! me too, I'm not tired of looking at those quilts. Hi, thankyou for posting this. Zigzag quilts have never appeal to me always thought they were boring; this is beautiful. you did an awesome job. All I can say is, Georgeous !!! I am loving the effect of the quilting! I can see that it would be pain staking and yet so worth it! Love this quilt. I really like straight line quilting. Free motion scares the beejeebees out of me. I use 505 spray on my quilts and that helps a lot with puckering on the back. It keeps the quilt sandwich together and washes out. Lovely, lovely. Thanks for showing us – I will never tire of quilts this attractive!! Ohhhh love it.. I don't do a lot of straight line work on my longarm but would love to do you one some time… on the house of course!.. Looking at your colors just makes me happy! So it seems like it might be fun to quilt it! This one is really lovely. The quilting really enhances the pattern, I think. Don't you just love HSTs? They are so versatile. Oh my goodness I love love love this quilt! You did an amazing job and I love the straight line quilting! I've been inspired! I recently did this kind of crazy zig-zag quilting on a disappearing nine-patch quilt (inspired by pics on your blog, in fact! ), so I feel your pain! It required lots of music and lots of deep breaths… Thanks for blogging this one, I really enjoy seeing your work. I love this new quilt. I love the colors you use. A few days you do not say anything, but here I am again seeing all the beautiful things you do. Patchwork from the Alpujarra "
So gorgeous! This is my favorite of the zig zags. Thanks for an inspiring blog! 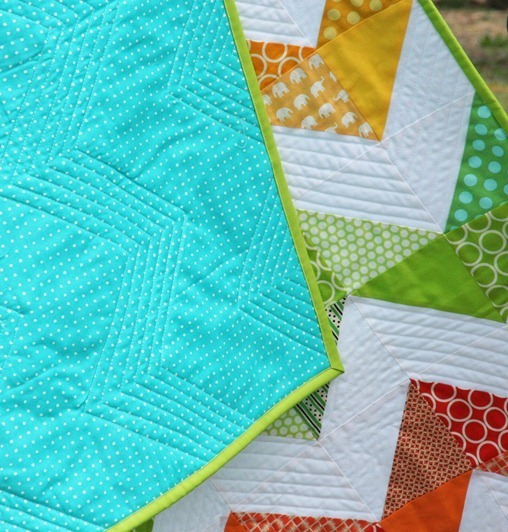 Love the color combo and the straight line quilting too! I HATE doing straight lines…do you have a tip on how you keep yours so straight? Do you mark them or use your sewing foot as a guide? Just gorgeous and, dare I say it…the straight line quilting makes it "pop"! I can totally relate…I HATE straight line quilting but I do it because I can't FMQ!!! LOL. 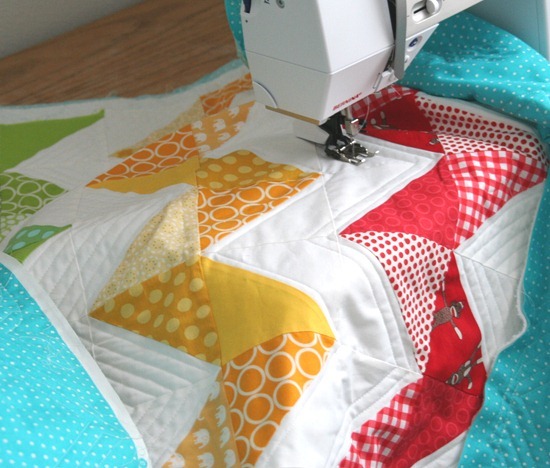 Straight line quilting is just perfect for this quilt, it looks great! Did you mark between lines? What a job!! And "reading" via my Zune takes me away from mundane techniques, I don't know that I could chain-piece, for example, without listening! oooh now you've gone and made me want to quilt today! Supposed to be doing nothing but can't resist a go at something with these quilt lines! I just finished a zigzag quilt with straight line quilting so I totally feel your pain. And yes, listening to books is such a great way to pass the time! I listened to most of Lord of the Rings and a few others. Maybe that will get me going on the quilting I'm working on now. I'm struggling with motivation. Now I've recovered from the first quilt I ever made, I want to make a zigzag quilt just like this one. I love all of your zigzag quilts, but I'm so scared to make one in case I get the lines wrong. I guess I'll have to start with something really small, like a cushion or something!